In addition to very powerful and distant objects such as Black Holes, Fermi's Large Area Telescope (LAT) observes continuous emission of very highly energetic light, gamma rays, from two of our closest and most familiar celestial objects: the Sun and the Moon. Venerated by many cultures, the cycles of the Sun and the Moon regulate our everyday lives. However, observing these very familiar celestial objects at gamma-ray energies is not easy, and was only begun recently, within the past 20 years. Fermi LAT is the only current telescope has been able to regularly observe the Sun and the Moon in gamma rays. Gamma rays from the quiet Sun and the Moon are produced by bombardment of high-energy charged particles, called cosmic rays. These cosmic rays come from more distant parts of the Milky Way galaxy, from well outside the Solar System, and are not produced by the Sun or the Moon. 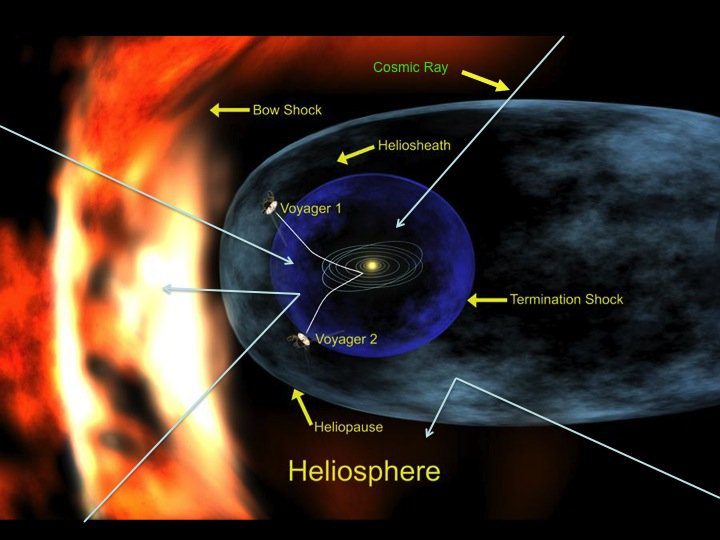 By looking at the Sun and Moon in gamma rays we can learn about our Sun, and about how these cosmic rays interact in the inner heliosphere, a region that is otherwise inaccessible. The Sun and the Moon as seen in gamma rays by the Fermi Large Area Telescope. Here, the yellow regions represent the brightest gamma-ray emission. Note that the Moon is brighter than the Sun. 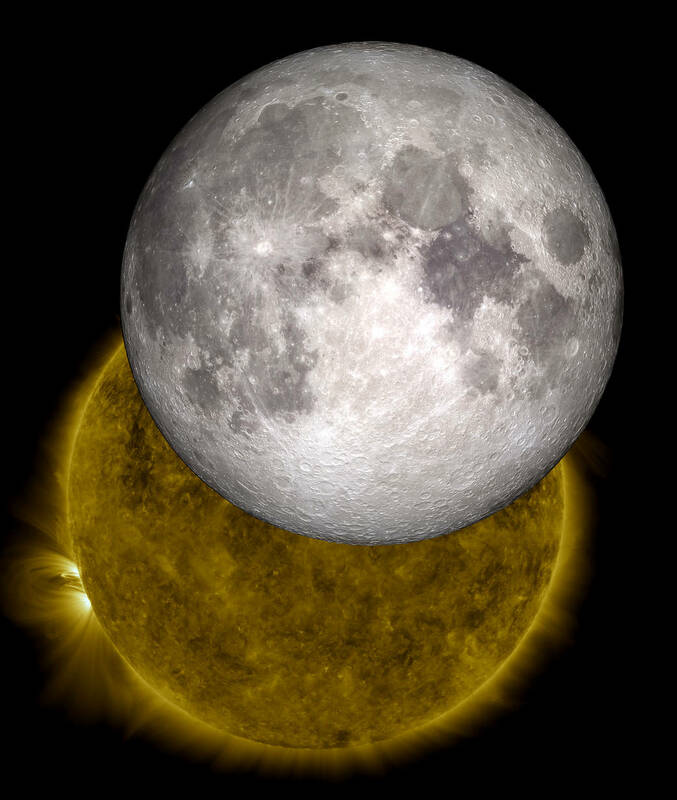 Remarkably, when viewed in gamma rays by the Fermi LAT, the Moon is brighter than the Sun, a distinct difference in comparison to other wavelengths with lower energies. This happens because the Moon is much, much closer to Earth than the Sun, making it appear brighter. Another cause for this difference is the outward pressure of the solar wind, which protects our Solar System by pushing away some cosmic rays, keeping them from getting close enough to interact with the Sun's atmosphere. This effect further weakens the gamma-ray emission from the Sun. Some cosmic rays cannot enter the Solar System because the solar wind pushes them out. Observations with the Fermi LAT show that the gamma-ray emission from both Sun and Moon varies slowly with time, tracking with the 11-year cycle of solar activity. In particular, during periods of high solar activity, the solar wind is stronger. This means that fewer cosmic rays penetrate the Solar System, and consequently fewer gamma rays from the Sun and Moon are produced. The opposite happens for periods of low solar activity, when more cosmic rays are entering the Solar System, and more gamma rays are produced.